Fandango's advertisements play before previews at participating movie-theater chains and feature lunch bag puppets telling various one- or two-line jokes and riddles centering on the company's name. The company also produced an advertising segment that is based on the song, "We are the World". Fandango's Android app was recently listed among Techlands 50 Best Android Applications for 2013. Industry revenue increased rapidly for several years after the company's formation. However, as the Internet grew in popularity, small- and medium-sized movie-theater chains began to offer independent ticket sale capabilities through their own websites. 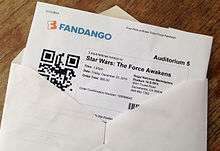 In addition, a new paradigm of moviegoers printing their own tickets at home (with barcodes to be scanned at the theater) emerged, in services offered by PrintTixUSA and by point-of-sale software vendor operated web sites like "ticketmakers.com" (and eventually Fandango itself). Finally, an overall slump in moviegoing continued into the 2000s, as home theaters, DVDs, and high definition televisions proliferated in average households, turning the home into the preferred place to screen films. On April 11, 2007, Comcast acquired Fandango, with plans to integrate it into a new entertainment website called "Fancast.com," set to launch the summer of 2007. In June 2008, the domain Movies.com was acquired from Disney. With Comcast's purchase of a stake in NBCUniversal in January 2011, Fandango and all other Comcast media assets were merged into the company. On January 29, 2016, Fandango announced its acquisition of M-GO, a joint venture between Technicolor SA and DreamWorks Animation which it would later rebrand as "Fandango Now"
Fandango is one of two major online advance movie ticket sale sites, along with MovieTickets.com. Before being acquired by Comcast in April 2007, Fandango was privately owned, with the major stakeholder being the largest movie-theater chain in the U.S., Regal Entertainment Group, including the United Artists and Hoyts theater chains. Along with other partners, Regal founded Fandango partly to prevent the older MovieTickets.com from establishing a monopoly on phone and online ticketing services. (MovieTickets.com is publicly owned and trades under the stock symbol HOLL.) Its advertising agency reportedly decided on its name because it sounded "fun, kinetic and smart," "easily pronounce[d] and remember[ed]--even though it really has nothing to do with movies." Prior to 2012, Fandango did not provide online ticketing for many AMC Theaters. However, it provided online ticketing for those AMC Theaters originally part of the Loews Cineplex Entertainment chain, due to contractual obligations in place prior to the 2005 merger of the two movie chains. Loews had previously attempted to break the contract in 2002 under pressure of bankruptcy and from (then) AOL Moviefone and its partner, Loews' Cineplex subsidiary; Fandango successfully sued both Loews and Moviefone and retained Loews' business. As of February 8, 2012, Fandango began providing ticketing for all AMC Theaters in the US, after which MovieTickets.com's fellow shareholders sued AMC for breach of contract. AMC and MovieTickets.com settled in 2013, with an agreement that the theater chain's online ticketing would be available on both Fandango and MovieTickets.com. In July 2009, it was revealed that Fandango along with other web sites, including buy.com and Orbitz, were linked with controversial Web loyalty programs, also known as post-transaction marketers. Fandango reportedly gave access to their customers' credit cards to the third party. The company held a trademark dispute of the name in December 2013 due to the fact WWE already trademarked the name "Fandango" for professional wrestler Johnny Curtis. In the fall of 2015 Website fivethirtyeight published a story calling Fandango's metrics on User ratings into question. The investigation noted that due to how the site calculates ratings it was rare for a movie to ever get below an overall rating of three stars. The problem seemingly extended from Fandango habit of rounding ratings up to the nearest half. Fandango, in response, noted that this was a glitch it was working to repair. Nevertheless, Gizmodo cited the study after Fandango announced the purchase of the Rotten Tomatoes over fears that the purchase would "ruin" the site. In early 2016, Fandango acquired two independent movie streaming services: Flixster and M-GO. Fandango re-branded M-GO to FandangoNow and began migrating Flixster Video users to the newly renamed service. FandangoNow is compatible with UltraViolet, a digital rights locker for many large film studios. ↑ "TicketMakers.com WHOIS, DNS, & Domain Info - DomainTools". WHOIS. Retrieved 2016-07-13. ↑ Anthony D'Alessandro. "Fandango Acquires Rotten Tomatoes & Flixster – Deadline". Deadline. Retrieved February 19, 2016. ↑ Newman, Jared (July 1, 2013). "50 Best Android Apps for 2013". Techland. Retrieved March 29, 2016. ↑ "Comcast's Fandango Buys Online Ticket-Seller Cinepapaya". Fortune. 2016-12-01. Retrieved 2016-12-03. ↑ Wallenstein, Andrew (April 12, 2007). "Comcast Adds Fandango". AdWeek. Retrieved April 29, 2011. ↑ Chmielewski, Dawn C. (June 24, 2008). "Fandango acquires Movies.com". Los Angeles Times. Retrieved April 29, 2011. 1 2 Ryan Faughnder (January 29, 2016). "Fandango buys online video retailer M-Go to boost 'super ticket' sales". Los Angeles Times. Retrieved January 29, 2016. 1 2 Longwell, Todd. "Fandango Re-Branding M-GO On-Demand Service as Fandango Now". Videolink. Retrieved March 17, 2016. ↑ Anthony Ha (February 17, 2016). "Fandango Buys Flixster And Rotten Tomatoes". TechCrunch. Retrieved February 17, 2016. ↑ Adam Lang, "Why is it called Fandango?" from RewindandCapture.com, October 29, 2014. ↑ Jackson, David (June 23, 2005). "AMC-Loews merger could shake up online movie ticketers Fandango and MovieTickets.com". Seeking Alpha. Retrieved April 29, 2011. ↑ Cox, Beth (August 2, 2002). "Fandango Heads Off An End Run". InternetNews.com. Retrieved April 29, 2011. ↑ "Fandango, AMC Theatres announce newly expanded partnership". ↑ Katey Rich, MovieTickets.com suing AMC setting up Fandango deal on CinemaBlend.com, February 8, 2012. ↑ McNary, Dave (January 21, 2014). "AMC Comes on Board MovieTickets.com Following Suit Settlement". Variety. Retrieved May 13, 2015. ↑ Richard Verrier, "Fandango and Moviefone dial up new partnership" in Los Angeles Times, May 23, 2012. ↑ Lucas Shaw, "Fandango and Moviefone partner for ticket sales" from Reuters, May 23, 2012. ↑ Sandoval, Greg (July 24, 2009). "Buy.com, Orbitz linked to controversial marketers". CNET. Retrieved April 29, 2011. ↑ "Another Tribute to the Tropps: Fandango WWE Issues". eWrestlingNews. ↑ Harris, Meena (August 21, 2014). "FTC Settlement Requires Fandango and Credit Karma to Establish Comprehensive Security Programs to Protect Consumers' Sensitive Personal Information". The National Law Review. Covington & Burling LLP. Retrieved August 24, 2014. ↑ "Fandango, Credit Karma Settle FTC Charges that They Deceived Consumers By Failing to Securely Transmit Sensitive Personal Information". ftc.gov/. Federal Trade Commission. Retrieved August 24, 2014. ↑ LaRose, Cynthia J.; Jake Romero (March 4, 2014). "Stop Phoning It in on Mobile Security: What Your Business Needs to Know About the Federal Trade Commission's (FTC) Settlements with Fandango and Credit Karma". The National Law Review. ISSN 2161-3362. Retrieved August 24, 2014. ↑ Machkovech, Sam. "FiveThirtyEight analysis finds inflated, rounded-up reviews at Fandango". Arstechnica. Retrieved March 17, 2016. 1 2 Plaugic, Lizzie. "You probably should ignore Fandango movie ratings". The Verge. Retrieved March 17, 2016. ↑ Novak, Matt. "Fandango Buys Rotten Tomatoes But Will Probably Ruin It". Gizmondo. Retrieved March 17, 2016. ↑ "FandangoNow.com WHOIS, DNS, & Domain Info - DomainTools". WHOIS. Retrieved 2016-07-13.